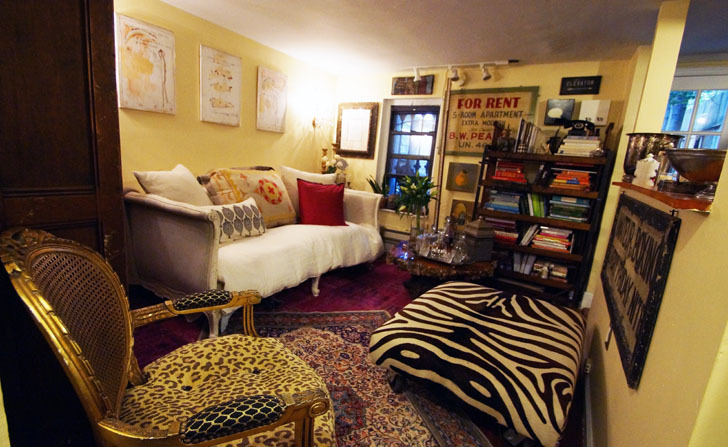 Brooklynite Suzy West knows how to live the luxe life in an impossibly small space. Her 200 square foot Brooklyn apartment may be small but it's packed with antiques and retro flair, proving that downsized living doesn’t have to be stark. Plus it's the perfect size for her toy schnoodle dog. SPACEStv recently spent a day with West to see just how she created a calm and cozy life in such a small space. Read on for some of their photos of this miniature but stylish home. Looking at West’s home, it’s evident that she has a background as a designer, stylist and curator. Her small yet rich space looks like an outpost of her vintage home store Collier West. Fusing decadence with minimal living, West’s teeny apartment has an opulent feeling and the select second hand and vintage pieces she has chosen give character to the space. West was drawn to her apartment because of the large and serene 600 square foot back yard that her kitchen opens onto. But a living space only one third the size of the yard proved to be a rewarding challenge. Luckily, downsizing spurred West’s creativity and productivity. She believes that paring down brings certain freedoms and allows her to spend more time on leisure activities, rather than cleaning or doing chores. To take command of her tiny space, West made use of a clever transforming bed. By day, it looks like a vintage couch, complete with decorative wooden feet. But remove the cushions and a specially made supporting bolster, and suddenly it becomes a sleeping space. Vintage crystal sconces add flair to her walls without taking up the space a chandelier would, and an oversized Victorian armoire acts as her personal card catalog, storing all of her goodies. Her closets are organized with bins from U-Line, keeping everything compact. What about her kitchen, bath and eating area. I do love her little space a lot !! It is evident in West’s home that she has a background as a designer, stylist and curator. Her rich, yet small space looks like an outpost of her vintage home store, Collier West. Fusing decadence with minimal living, West’s teeny apartment has an opulent feeling with the select second hand and vintage pieces she has chosen to give character to the space. West was drawn to her apartment because of the large and serene 600 square foot back yard that her kitchen opens onto. But with a living space only one third the size of the yard proved to be a rewarding challenge. Through downsizing, West feels truly creative, inspiring her productivity. She believes that pairing down brings freedoms, where more time can be spent on leisure activities, rather than cleaning or doing chores- as well as reducing one’s footprint! To take command of her tiny space, West’s key is her bed. By day, it looks like a vintage couch, complete with decorative wooden feet. But remove the cushions and a specially made supporting bolster, and suddenly it is transformed into her bed! Vintage crystal sconces add flair without taking up the space a chandelier would, and an oversized Victorian armoire acts as her personal card catalog, storing all of her goodies. Her closets are organize with bins from U-Line, keeping everything compact. West’s gorgeous apartment ironically combines luxury and minimalism, a characteristic that feels truly New York City.